The city of Venice is well worth a visit in itself. Even more so when you go camping there. That’s right, this famous Italian city has many pleasant mobile home and bungalow sites. We can offer the CA’SAVIO campsite, which has a very large pool in its grounds, as well as direct access to a well-maintained beach. Located not far from Venice, the ORBETELLO campsite lets you enjoy the dazzling blue of the magnificent lagoon. Here you can also rent mobile homes or bungalows to discover the local area, like Cavallino, for example. You can choose from different types of accommodation depending on the surface area you’d like. You’ll have everything you need to make you feel at home. 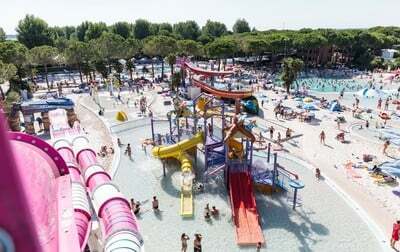 Various facilities are also available to enhance your stay on our Venice campsite. You can also choose to stay on our Villaggio dei Fiori campsite, which also offers unrivalled service. What is there to do around Cavallino and Venice? Treat yourself to a holiday on a campsite in Venice and enjoy lovely weather, above all in spring, summer and the first half of September. It’s the best time of year for anunforgettable holiday in Italy. Easily share your search by email as a wish list, with your family, your friends, your boss and even with yourself to find it later! Separate the addresses with ";"
Sign up for our Newsletter and receive our Flash Sales and all our Good Deals in preview! Your e-mail has been sent to your friends. An error has occurred when sending the mail, thank you for trying later. Do not forget to enter the email address of your recipient. Please enter your email address to suscribe to the newsletter.